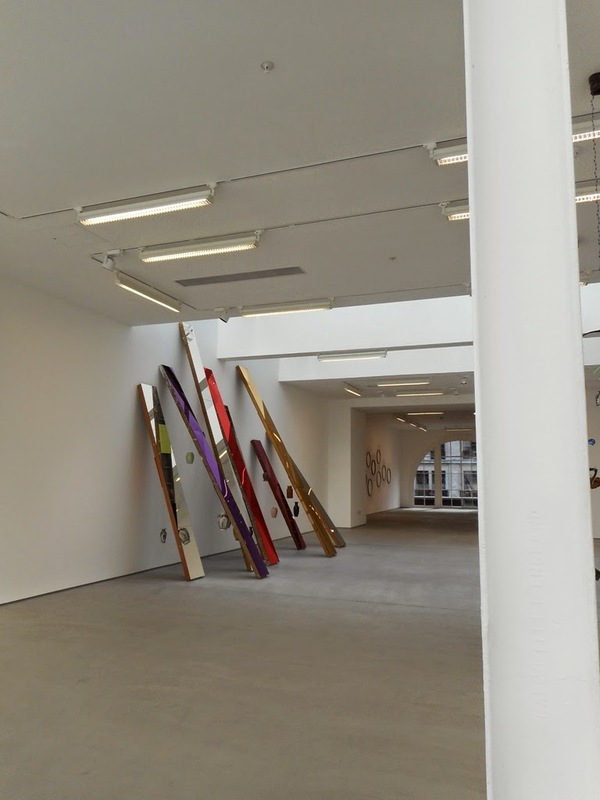 These are new works by Jim Lambie, site-specific to 62 Kingly Street in one of its previous lives as a nightclub. The people have gone from the dance floor but Lambie has put them back again. 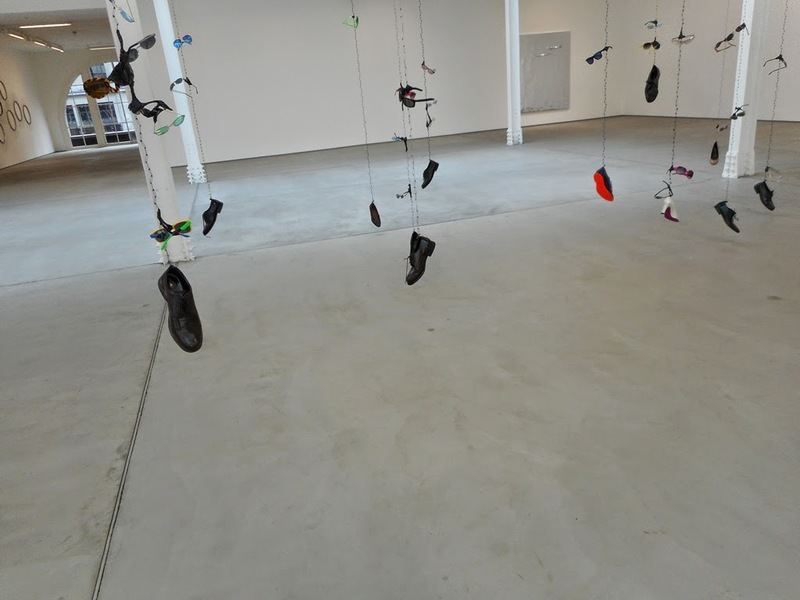 Suspended from long chains of safety pins, single shoes of men and women, mixed together as is their natural disposition, crowd the middle of the floor. They spin and spin, gently gyrating to unheard music. Further up each chain, at the dancers' eye level, you find designer shades glinting down at you. As you carefully make your way through the dancers, one pair in particular (see pic) fluorescently stare back "I see you giving me the eye," they seem to say. You notice a male shoe (pic below) doing a particularly spritely dance on tiptoe. The entire sole is lacquered orange. You find that the shoe soles are all painted different colours. An hommage to Christian Louboutin. "Nightclubby but nice" might be your reflexive thought, an hommage to Salman Rushdie. There is plenty to prance about. There on the far wall you find an array of mirror panels, pink. purple, orange, in which to admire yourself. These make an equally dazzling showpiece. They actually consist of a row ot wooden ladders sturdily set up at different angles against the back wall of gallery and to which the mirrors are attached so that they capture the eye. Ah but they're artified ladders (see pic below). From the front all you see is that the ladders have been adorned with large panels of either plain or tinted glass: jazzy orange, pink and purple. You know of course that you should always look behind sculpture; if possible walk right round it. Here the artist seems to say – what if you hadn't looked behind the mirror? You would have missed these. 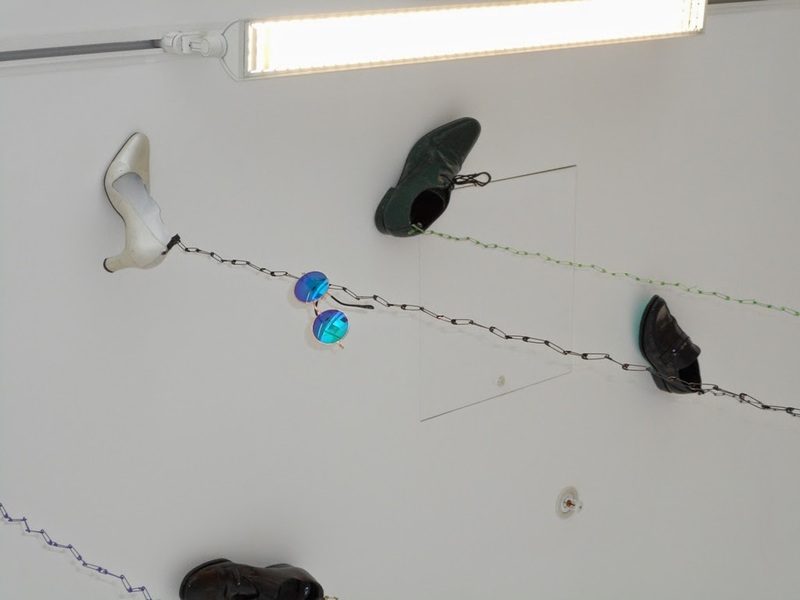 "These" are various jars and vases, suspended from the exposed rungs of the ladders at the back. Perhaps the fun we had or should have had in youth, the glitz, the prancing around on dance floors, the admiring ourselves in mirrors, remains and is evoked in the works just discussed. As aging of any dancing generation inexorably takes place, the multiple connections of the present give way or are displaced by the multiple connections (represented by the wall-mounted high gloss black work) of what? An ICU? Perhaps not. But certainly a switchboard that is now dead and gone cold. So the image, if not now "in" the mirror, "through" the mirror to the otherside. It's a beautifully uncluttered show, leaving space for the viewer to assign what meaning they will to the works.